Here again I set myself apart from most other skull cleaners. Most familiar process used is dermestid beetles, as some refer to them as just the bugs. I have seen and tried many methods and have come to the conclusion I like the results of maceration the best, even over dermestid beetles. What is maceration? Maceration is decomposition of all soft matter on the skull under water. I do a warm water maceration under controlled conditions. Advantage? Maceration lets bacteria do the work. Bacteria gets into places the beetles can't get to such as bone marrow. Another big advantage is the bacteria even eats the grease that often leaves the skull with dark gray and yellow spots. After that I still go through a special degreasing process to remove any remaining grease to insure a cleaner skull that will still look nice and white in years to come. Last but not least, especially important for those bear hunters, the bear skulls maceration leaves little to no shrink maximizing measurements. Once I have the European mount completely clean I begin my finishing process. The first step is to whiten the skull with a very strong hydrogen peroxide. 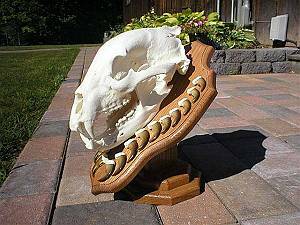 Some skulls such as bear skulls have nearly all of the teeth fall out. These are all collected, whitened, and glued back in place so you never have to worry about loosing them. In the case of bear skulls you have that option to have it mounted with the jaw open. After the European mount is dried I give it a special treatment of a non glare matte finish preservative to help show off the skull.